We suggest spending at least 10 days in Sicily, as there are many different areas to visit. You can fly into Catania or Palermo airport, but please be warned that Catania airport is subject to closings if there is activity on the nearby Mt. Etna. Flying into Palermo, you will want to spend 2 nights in the city. The first day will be spent visiting all of the cultural treasures Palermo has to visit, including the Cappela Palatina, the royal chapel of the Norman kings. It was built in 1132 in the style of Byzantine architecture, and houses stunning collection of elegant, luminous mosaics in gold and bright colors. Palermo is a blend of architecture and customs deriving from Norman, Arab, and Byzantine influences. The next day you might consider visiting the nearby towns of Monreale or driving east to see the charming seaside town of Cefalu. For your next stop we suggest that you head west to the province of Trapani. Explore the open air market, Piazza Mercato di Pesce on the northern waterfront, which sells fresh seafood and a variety of local specialties including cheese, fruits, and nuts. 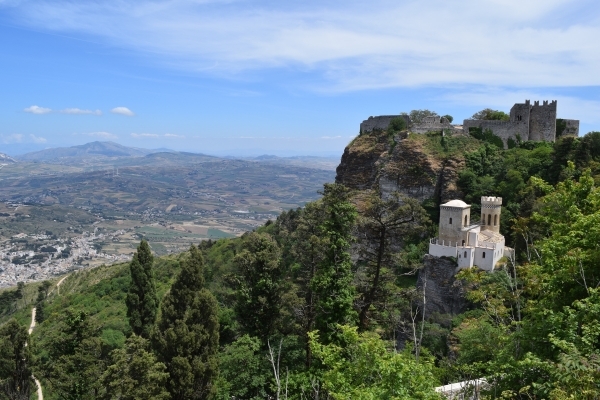 The next day, take the funicular or drive up to Erice, a picturesque town that sits 2,500 feet above sea level. Should you have more time, you can easily visit the Salt pans and the Island of Mozia which was once a Phoenican port city or the Greek Temple of Segesta. Traveling Counterclockwise, we suggest a top in Selinute, founded in 650 BC by the Greeks. Tour the impressive archeological site, with remnants of the Greeks who came to conquer Sicily and eventually abandoned the town during the Punic wars. That afternoon, enjoy a private tour of the Temples of Agrigento. This impressive site houses one of the largest collection of Greek temples in the world. The temples are in better shape than many of those in Greece, as they were built to show the power aned prestige during the Greek’s conquest. For garden and botany lovers, don’t miss a stop at the Gardens of Kolymbetra, whose impressive gardens house thousands of species of plants and trees. The next day, get out your swimsuit and sunglasses and enjoy a private boat tour along the coast. You will stop to swim at your leisure, and enjoy a delicious catered lunch on board. After a sound nights sleep under the temples, depart with your driver to Piazza Amerina. Here you will have a private tour of the impressive Villa Casale della Romana, this 4th century villa houses one of the largest, richest and most varied collection of Roman mosaics in the world. After visiting this UNESCO World Heritage Site, enjoy lunch at a local trattoria before heading back in the car. As a base for the final three days in Sicily, we suggest the charming town of Ortigia. Ortigia is the historic and cultural center of Siracusa, which was settled by the Greeks around 735 BC. On your first afternoon, visit the archaeological site with a private historic guide. The next day, enjoy a cooking class with a local home cook. First you will visit the famous open air market, which offers everything from freshly caught fish, to exotic fruits and homemade cheeses. Continuing on the eastern side, head to Mt. Etna and enjoy the hiking trails and spend the morning trekking around the impressive craters before heading to a winery on the slopes of the mountain. No visit to Sicily is complete without a stop or overnight in Taormina, which was and still is part of the Grand Tour of Sicily. With her luxury hotels, eloquent shops and lovely vista you can easily stay here a few days to enjoy the views. As all good things must come to an end, the next morning you will be transferred to Catania airport for your departure flight.